This case is built to precise weatherproofing standards, with a rubber seal and steel back that prevents dust build up and remains dry even in the fiercest of rainstorms. Thick toughened glass provides even more protection. 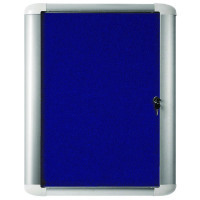 The door features a lock and two keys for securing the display case against tampering, so you can display important messages in all environments. The display case also features 4mm toughened glass for extra protection and comes with a built in resistance to water damage. Designed to hold A4 sheets, this display case from Bi-Office has been weatherproofed to IP55 standards.